The archive of materials in Aboriginal languages at livingarchive.cdu.edu.au is living and growing, with more than 1000 items in over 25 languages from around the Northern Territory. Hundreds more items are still being discovered and processed, to be uploaded when permission from the creators is obtained. One of the four strands of Stage II of this ARC-funded project is designated ‘Academic Engagement’. The goal is to establish a network of academics involved in teaching and researching Australian languages, to facilitate research which involves collaborations with language owners through the archive in undergraduate teaching and postgraduate research. Using texts (and related resources) from the Living Archive in teaching and research work. Develop an audit of texts in (NT) Aboriginal languages in PhD theses and other research projects which could be included in the archive, and people to contact for permission. Locate texts in other archives which could be shared with the Living Archive and vice versa. This work may be done as a consultancy or part of a research project, or other arrangements can be negotiated. Please contact us for more information or to express your interest in being involved. This entry was posted in Academic and tagged academic, engagement on December 4, 2014 by Cathy Bow. 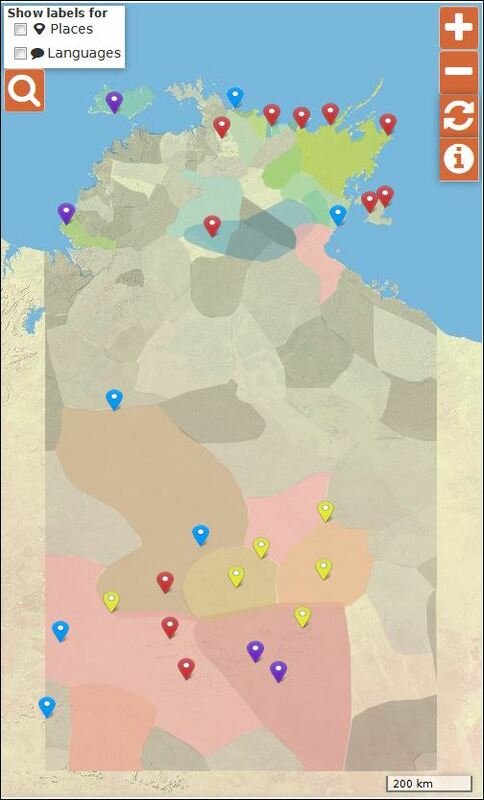 Rumour has it that the Northern Territory Government is proposing to scrap the one remaining linguist position in the southern part of the Northern Territory. This position has been going since the mid 1970s, and the occupants have worked with Indigenous people and schools to create shared understandings of Indigenous languages, of the needs of school-children for understanding what happens in the classroom, of the needs of Indigenous teachers for support and training. They have produced amazing materials in Indigenous languages for classrooms, curriculum materials and reference documentation, some of which is archived and available in the Living Archive of Aboriginal Languages. Rumour also has it that the reason for scrapping the position is because there is “no need for any linguistic expertise in Central Australia and the Barkly schools”. But rumour doesn’t have it that the kids have all staged a revolution and started speaking Standard English. Nor has rumour passed on in whispers evidence that their NAPLAN results have suddenly reached those of middle-class Australian non-Aboriginal children. Nor that their results will get better if their teachers know less about their languages. And fact, not rumour, indicates that wilful blindness to children’s language needs violates the language rights of indigenous peoples – see the UN’s declaration on the rights of Indigenous people. Articles 14 and 15 are fine statements of language rights, and of the need for states to provide resources to back up the rights. If rumour is right, then Indigenous children in the Northern Territory are losers again. Indigenous children have the right to all levels and forms of education of the State. All indigenous peoples also have this right and the right to establish and control their educational systems and institutions providing education in their own languages, in a manner appropriate to their cultural methods of teaching and learning. Indigenous children living outside their communities have the right to be provided access to education in their own culture and language. States shall take effective measures to provide appropriate resources for these purposes. This article was originally published on the Endangered Languages and Cultures blog, reproduced with permission. This entry was posted in Academic and tagged blog, education, NT, Paradisec on October 28, 2014 by Cathy Bow. Tony Abbott is spending this week in North East Arnhem Land, part of his long-held hope “to be not just the Prime Minister but the Prime Minister for Aboriginal Affairs”. We asked our experts: what stories does the PM need to hear while he’s in the Top End? Promising “a new approach to engaging with Aboriginal and Torres Strait Islander people to achieve real results”, the top priorities of the Australian Government’s new Indigenous Advancement Strategy are “getting children to school, adults into work and building safe communities”. Based on 40 years of experience in Top End education, I’d argue that if you can get the schooling right – which involves adults just as much as kids – you can lay the foundations for more adults in work and safer communities too. “Free, compulsory and secular” education took a long time to establish for Aboriginal children in the Northern Territory. I arrived at Milingimbi in the early 1970s as one of the first government educators, soon after the good-willed but under-funded Methodists had handed over their mission schools to the Northern Territory Administration Aboriginal Welfare Branch. There, the parents asked me why, if education were so important, it was visited upon children rather than adults. I had learnt in my now radical-seeming teacher education in New Zealand the stories of how formal, universal education had served to keep poor children off the streets while their parents worked in the factories of the industrial revolution, and how it prepared the children for the same menial repetitive work in confined spaces for extended periods (the rich already had their schools). Yet at Milingimbi in the 1970s, there remained a vibrant Methodist tradition of adult education, and plenty of interaction between the school and adult education staff and students. Every classroom had at least one local Aboriginal teacher, and there was often a grandfather outside under a tree singing or a mother telling stories. Operating without carrots or sticks for attendance, the school had a central place in the life of the community, and we spent much time on country. We learnt from the elders that each child in school was unique to his or her particular links to history, people and place, and that we needed to understand and acknowledge those differences. Today, times have changed. Under the pressures of “normalisation”, people everywhere are paying attention to NAPLAN test results. They are particularly poor for Aboriginal children in remote communities who grow up with little English around them, and who come to school whenever it pleases, truancy officers notwithstanding. Communities and governments alike are looking for new and different ways to work collaboratively towards “Indigenous Advancement”. If I were asked for ideas that could “achieve real results” – in remote Indigenous education – the following two would be at the top of my list. School can be an alienating experience when there are no senior family members around and no teachers speaking familiar languages. And the ancient practice of growing up children as independent agents in their environment, free of coercion, is still very strong in remote communities. Parents would love to see their kids in school every day, but only if their kids choose to be there. The kids will choose to be there if they can see their families and clan elders working together with teachers and community leaders to make active contributions to their schooling and their futures. Finding good ways of welcoming parents and elders – including their languages and authority – back into schools would do wonders for the NAPLAN results, if only because of improved attendance rates and the commitment of parents to a collaborative working together. We must also think about the new generation and its contribution to our future. The emphasis on English and maths results above all else means kids are assessed well before they are confident in the richness of their local identities and connections. There is so much knowledge – including local languages, history, culture, environmental and ecological knowledge – that is there, waiting to be tapped into and reappear in classroom life, just as that knowledge was shared very productively in the past. If Aboriginal families and their knowledge were taken seriously in schools, alongside the important knowledge from the outside world, it would not only revive the attendance rates but also prepare students to take part in the changing remote economies. This isn’t just wishful thinking. If we want Aboriginal people to take an active and productive part in the future of remote Australia, a combination of traditional Aboriginal and contemporary Australian knowledge is very much what we need. A film about a collaborative project between CSIRO and Aboriginal rangers, organisations and community people, tackling showing locals were tackling weeds in central Australia. There are practical ways that traditional knowledge can be a crucial path to future employment for young Aboriginal kids. For instance, in environmental services, major carbon abatement projects (such as fire management), biosecurity and invasive species management, cultural heritage management, language, history, law, and many other areas. All Australians benefit from having healthy, strong, bi-cultural Aboriginal populations in northern and central Australia. Would you risk losing your home for a few weeks of work? Michael Christie receives funding from the Australian and Northern Territory Governments to undertake governance research, as well as funding from the Australian Research Council. This entry was posted in Academic and tagged Conversation, lifelong learning, local knowledge, Michael Christie on September 18, 2014 by Cathy Bow. The question of what language(s) to teach Indigenous students, what languages to teach them in, and how to go about it has been generating a little political heat (but not quite so much light) of late. On ABC’s Q&A earlier this month, Yalmay Yunupingu – the widow of Yothu Yindi front man Mandawuy Yunupingu – asked a pointed question about how the teaching of Indigenous languages will be funded given that Article 14 of the United Nation’s Declaration of the Rights of Indigenous People states that Indigenous children have the right to education in their own language. And a recent piece in The Conversation by Stewart Riddle sparked controversy after he said it could be argued that the emphasis placed on English literacy was no better than discredited historical attempts to make Aboriginal kids more “white”. In fact, there’s a broad consensus that Indigenous students need to be taught English to fully participate in society. Most people also agree Indigenous languages need to be preserved. But there’s a great deal of confusion about how to go about this. This stems from confusion about how to address the language needs of children. How and what do we teach Indigenous children? Let’s begin with children who come to an Australian school speaking an Indigenous language or Cantonese or Arabic or a language of Somalia or… These children need to learn English as a subject – they need to learn English grammar, pronunciation, and to expand their English vocabulary. Otherwise they’re cut off from the goods and services of mainstream society. Everyone agrees on this: Indigenous parents, immigrant parents and teachers alike. Where they disagree is how this should be done. There’s the el cheapo sink-or-swim approach – we chuck the kids into an English-only classroom where they don’t understand a word of what is being said, and then we expect them to learn to speak English by immersion. This may work in classes where almost all the classmates speak English and the child’s parents can provide support at home. But it doesn’t work in classrooms where the classmates don’t speak English, and where parents can’t read or write English. If a child can’t understand what a teacher is saying about arithmetic, then they won’t learn the basics of arithmetic. Children become bored with not understanding what is happening in the classroom, and lose confidence in their ability to join in mainstream society. There’s a better approach – where children are taught in English, but where from the start teachers do teach them English as a subject in a systematic way, building up their confidence in speaking, reading and writing English. This will result in delays in understanding subjects such as arithmetic and science, until children have mastered enough English to understand what the teacher is saying. But at least it gives them a chance to learn English well. In both these approaches, the home language is sometimes taught as a subject for perhaps 30 minutes a week. This doesn’t help children understand what is happening in the classroom, but it may give them a sense that the language is valued. However, to do this properly, a staged curriculum is needed, where children build on what they have learned, and enhance their knowledge. There aren’t the materials to do this in many communities, and so children may endure a lot of repetition of the same low-level material on plants, animals and artefacts. This may lead them to think that their home language is a restricted language, not something that they can use on Facebook, or something to use to talk about rockets, asteroids etc. Then there’s the best practice approach – where the home language is used as the medium of instruction in the classroom at the start. Children begin school with teachers who can explain what’s happening in the classroom in their home language. These teachers can teach children English in a systematic way, building up their confidence in speaking, reading and writing English grammatically. They can explain the fascinating and complicated ideas of maths and science in a language that children can understand, until they have mastered enough English for a switch of language of instruction to English. This is ideal. 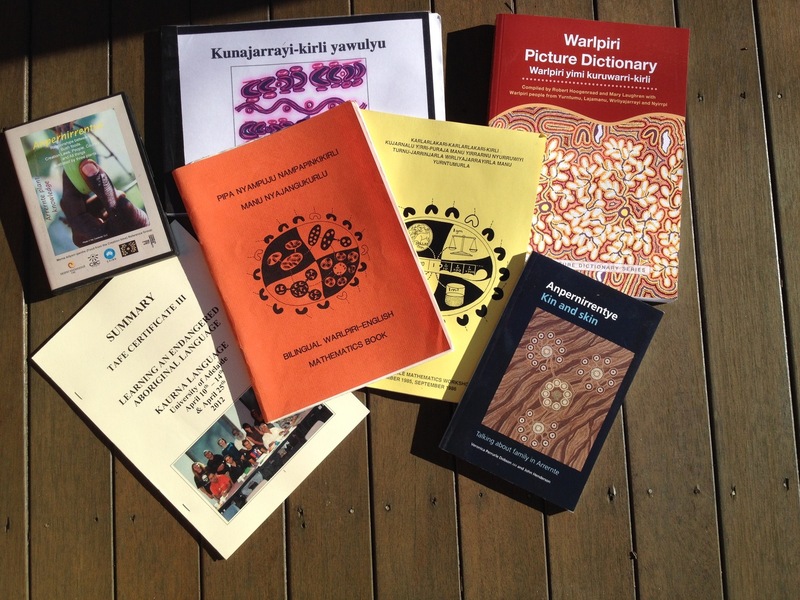 For it to work, governments need to invest in training fluent speakers of the languages as teachers, in helping them learn how to teach children to speak, read, write and understand English, and in developing elementary curricula and materials in the languages (see the Living archive of Aboriginal languages for examples). The payoff of a good mother-tongue-medium instruction program is excellent – children who can talk about a range of ideas in two languages, and who grow up knowing that both their languages are valued. As the children grow older, there’s the question of enriching their home language. As English speakers, most Australians are used to developing a mastery of the language in school, through using it to talk about maths, the economy, genetics, and so on. They learn new ideas and new words to express these ideas concisely. Classes on English literature, poetry, plays, and films are other ways of increasing our knowledge of English. A few second language speakers of English may be lucky enough to have the opportunity to enrich their home languages in a similar fashion – German or French or Mandarin speaking children may be able to go to bilingual schools in Australia where they can learn to talk about ideas in a sophisticated way. They can learn at school about the histories and societies linked to their home languages. They can read Goethe, Victor Hugo, Mo Yan. Indigenous children have no such luck. The domains in which they can use their home languages are shrinking, there is little or no material in their languages for them to study at school, and compulsory schooling in English means they have less time to speak their home languages anyway. Very few learn at school about the great works of verbal art of their communities. All too often, teaching about Indigenous arts at school is reduced to “didgeridoos, dots and damper”. Teaching at a higher level requires teachers who know the Indigenous language and understand the language of songs and storytelling, or who can collaborate effectively in team-teaching with senior Indigenous singers, performers and story-tellers. English-only schooling as practised in most Australian Indigenous communities is destructive – it reduces children’s ability to learn English, to learn other subjects, to learn about the verbal arts of their own societies. It reduces opportunities to enrich their first languages through discussing new ideas in those languages. In the long-term, it reduces the chances that the next generation of Indigenous children will be bilingual in Indigenous languages and English. And in that way English-only schooling reduces the chances that Indigenous languages will survive much longer. Jane Simpson receives funding from the Australian Research Council. She is a member of the Friends of Bilingual Learning. This entry was posted in Academic and tagged Conversation, education, Indigenous, language on August 21, 2014 by Cathy Bow. The Living Archive of Aboriginal Languages was officially launched in Canberra on Thursday March 6, 2014, by the Honourable Dr Sharman Stone, Federal member for Murray. (Launches in Darwin and Alice Springs are also being arranged). Around 80-100 people gathered at the Law Link theatre at ANU for the event, which featured a public lecture by Professor Michael Christie, and a speech from Dr Stone. Michael, who works at the Northern Institute in Charles Darwin University, is one of the chief investigators of the Living Archive project. Michael’s lecture was introduced by the Pro-Vice Chancellor for Student Experience at ANU, Professor Richard Baker, who said how much he had valued the article “Yolngu metaphors for learning”, which Michael had co-authored with Raymattja Marika-Mununggiritj in 1995. In his presentation, Michael reflected on his 40 years experience with Aboriginal languages, literatures and technologies in the Northern Territory. He described the three phases of bilingual education, from his early days at Milingimbi in the 1970s, beginning with early investment in Indigenous and English literacy, then moving to the phase of Aboriginalisation, where local knowledges and pedagogies found their place in the curriculum. The current phase involves both disengagement and re-engagement, with the Living Archive being a tangible result of both. Michael’s talk was illustrated by photos from his ten years at Milingimbi—including ones of him as a bearded young man in a jeep—as well as the decade he spent at Yirrkala, plus images of the many books produced in bilingual education programs and later digitised for the Living Archive collection. Following the lecture and questions, the Dean of ANU’s College of Arts and Social Sciences, Professor Toni Makkai, spoke of the value of universities in projects such as the Living Archive, the importance of collaboration across universities, and the significance of funding from the Australian Research Council for projects such as this. Professor Makkai then introduced Dr Stone, and invited her to to launch the archive. Dr Stone referred to her role as deputy chair of the House of Representatives Standing Committee on Aboriginal and Torres Strait Islander Affairs Parliamentary inquiry into language learning in Indigenous communities. She spoke of her anthropological research and her engagement with Indigenous people in her own electorate in Victoria, where she had introduced a language program for prisoners. She spoke warmly about the value of Indigenous languages to engender an increased sense of self, an understanding of kinship systems and natural resource management, and noted the importance of preserving materials such as those included in the archive for current and future generations of Indigenous people. The audience included a number of linguists, as the event coincided with both a workshop on Australian languages in contact since colonisation and the 13th Australian Languages Workshop, held at ANU in Canberra and its coastal campus at Kioloa. Guests were also invited to view and purchase the 32-page booklet produced to accompany the archive, giving some background and context to the materials included on the website. Posters and brochures were also available, with many people admiring the colourful map which displays both languages and locations, and which is a key part of the website’s interactive interface. 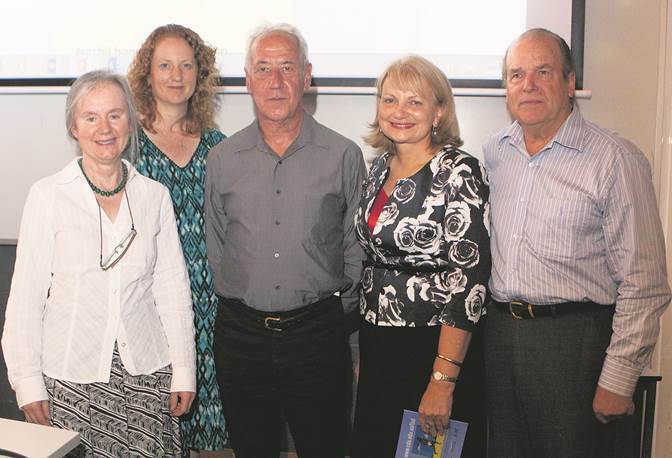 The Living Archive team – chief investigators Professor Michael Christie, Doctor Brian Devlin (both from Charles Darwin University), Professor Jane Simpson (Australian National University), along with project manager Cathy Bow, sincerely thank all those who have participated in the project and helped to arrange the launch. This entry was posted in Academic, Activities and tagged ANU, launch, Michael Christie on March 17, 2014 by Cathy Bow.